Are your gutters protecting your home from water damage? American Eagle Exteriors got its start doing gutter installations. The Reger family has been installing gutter and leader products in the North Jersey area since 1979. Our attention to quality and detail over the last 30 years is unparalled in the business. We take pride in providing outstanding workmanship in all we do. 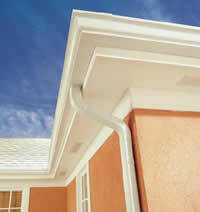 The most commonly used product is the 5″ seamless gutter which generally utilize 2″x3″ leaders. This is the industry standard for most residential houses. However, due to the size of some projects, the need for long lengths of guttering with fewer leaders, and commercial buildings, we offer the larger sized 6″ seamless gutter with accompanying 3″x4″ leaders. For the average house, installation takes just one day. 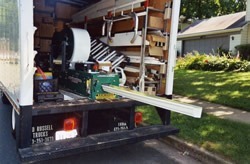 Our crew will arrive with a truck-mounted seamless gutter machine with the color you have selected. Each piece is measured individually, and the seamless gutter machine will create a continuous piece of gutter that is custom sized to your project. The best option for the actual installation of the gutter to your project is the inside bracket, also known as a hidden hanger. This bracket interlocks into the gutter for a cleaner look and is then attached to the roof under the shingles, utilizing a stainless steel screw for superior strength. The method of screwing the gutter to the fascia board. Downspouts are then placed as needed, according to the amount of roof runoff each section of gutter has to handle, as well as the where the best location is for directing the runoff away from the house. Our gutter professionals do all that while also making the leader placement the most aesthetically pleasing to the eye as possible. We will fully discuss leader locations and options for water disposal with you so you know what to expect before the job starts. Finally, we know how much you care for your project/house/business. Thus we will do our very best to leave the jobsite in the same condition as when we arrived. A job without a full cleanup is not a completed job! Cleaning gutters can be a hassle, and even with the right preparation, it can be dangerous for those inexperienced. We recommend having Gutter Drain installed on your system for the ultimate protection. After installing the unique Gutter Drain gutter cover system, you will never have to clean your gutters again: Guaranteed! Gutters that become clogged cause rainwater to build up and eventually overflow, causing damage to your soffits, fascia and siding. 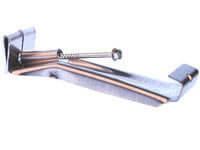 Gutter Drain helps protect your home by preventing leaves and debris from ever clogging your gutters. So, call now to receive a FREE estimate!